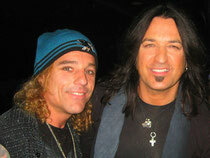 Darryl (our Nikki Sixx) enjoyed seeing his friend Michael Sweet of Stryper during a performance for the Monsters of Rock. Our bassist Darryl killing time with Jack Blades and the rest of Night Ranger while boarding the MSC Poesia for Monsters of Rock, The Voyage featuring dozens of famous 80's rock bands and tribute bands. 4 full days of continuous rock & roll!!! I Love this cover band! You guys are awesome. I didn't realize your singer was a woman until I saw the name listed on the website..she was almost convincing as Vince. 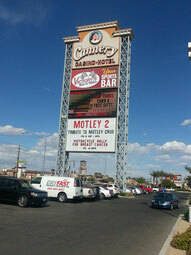 I've seen Motley Inc. and True to Crue, their lead sounds more like him. Although you guys captured the look! You guys ROCK!!! I saw your show and will be at the Arena for the next one! Your singer is AMAZING! It is rare when is a woman is steaming hot AND has talent! Will you marry me Veronica??? I will be there Friday! You are so much better than other Crue tributes. You are the only one I've seen with a female lead. ALL of you are amazing! I shared this on Facebook! My buddies will really like it! A garden greenhouse cleaning service are able to do several circumstances to benefit the planet, including using ecological cleaning solutions and pure cleaning procedures. These separate any given garden greenhouse cleaning service coming from a traditional one particular. When deciding whether using the services of a garden greenhouse cleaning assistance.